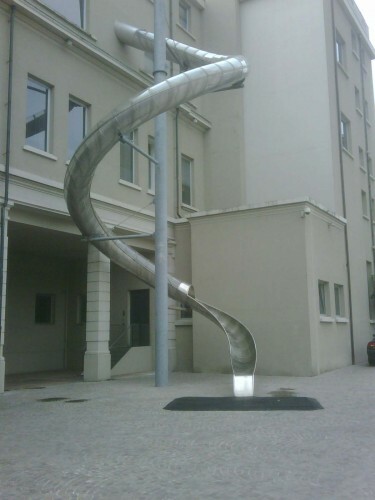 One of the most fascinating details in a new WWD interview with the ever-fascinating feminist designer Miuccia Prada is that she has a Carsten Höller slide in her office that directs from behind her desk to an outside courtyard. Others have opined about this—a similar slide traveled to the New Museum in 2011—but I wish the topic had been explored further; whether the 66-year-old icon uses it as a regular exit; or whether, during particularly stressful meetings, she just chunks a deuce and bes out. When does she use this slide! I’m interested in the economic part because I’m interested in knowing what people think. I challenge myself because I want to verify if I’m in sync with people. My problem is to be sure I am in sync, even when ideologically I’m against fashion. Those designers that have spent their life copying a little bit here and a little bit there and pass as creatives, well, that bothers me. Whether they copy me or others, it’s the same. Read the whole thing here, it’s great.